If I were to say lets have some "Escarole and Beans" , what you you think? An Italian-American soup? Better yet the classic Italian Minestra? A restaurant in Chicago ? Or two separate plates that complement each other ? Well to answer this we need to take a little trip into grammar land. Remember Coordinating Conjunctions ? Conjunctions typically are used to connect to clauses. In "escarole and beans" take out of context , it would be stretch to consider the nouns "escarole" and then "beans" fully formed clauses. This opens up the possibility of interpreting the term "and" more in the sense of "with". Indeed this is the more common way foodies might see it. Just think of "rice and beans" - "arroz con frijoles" in Spanish , "arroz com feijao" in Portuguese; it is very clear what is intended as a dish. I like to make things subtle so let me take "and" strictly as a coordinating conjunction and toss out any possibility of an "ablative of accompaniment" meaning. As a result , when I said "Escarole and Beans" my intention was to emphasize two independent dishes that happen to work so well together and can be prepared in parallel. When consuming both dishes, make sure to eat them warm, and also not mix. Experiment with an savor each independently. The really deserve the honor. A light chilled white wine enhances the experience such as a white Cotes-Du-Rhone. This dish most certainly has peasant origins. It is as simple as it gets. 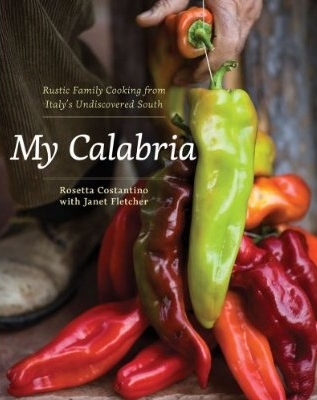 Just imagine heading to the vegetable garden, kneeling down, cutting one or two heads of escarole, rinsing them in running water, and then bringing them back to the kitchen, ready for preparation. From plot to plate in matter of minutes. The fan club could believe that is tasty veggie dish is also very good for you. 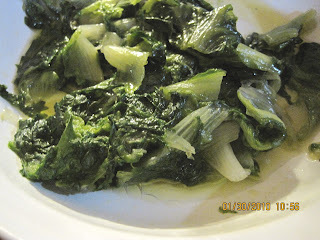 I just wish that I could find escarole as sweet more often. Blanche the escarole in salted water until tender. Drain water, toss with abundant EVOO. Consume warm. It is best to start with dried beans. But this takes longer and usually requires overnight soaking of the beans. To short cut this process. you can get pretty good results if you start with premium canned beans. 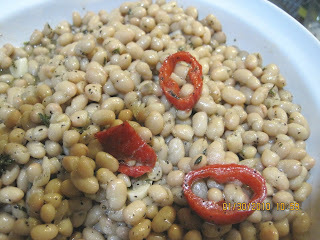 The trick is to select beans that are small in size such as navy or great northerns (avoid cannellini as the canned ones are never al dente) , less creamy and to rinse then in cold water so that any excess starch is removed. I have repeatedly had very good success with "habichuela blancas" from Goya. Fan club and guests around the island have beans in the hearts. Never a complaint, just surprise as to how good a simple seed can taste. Toss cooked beans in a high rim skillet. Add EVOO, S/P, EVOO , coarsely minced garlic . Cook no more than 20 minutes ensuring that the beans remain "al dente". Add some liquids as neeed. We do not want to fry or overcook these precious little ones. Serve as a side dish, or as appetizer. How about with crumbled goat cheese on friable butter crackers.